The Samsung Galaxy Alpha measures 132.4 x 65.5 x 6.7 mm, compared to 142 x 72.5 x 8.1 mm for the big Galaxy S5. It's lighter too, 115g vs. 145g. Samsung's shift in design has to be felt to be believed. No, really, on the outside the Samsung Galaxy Alpha is very similar to the Galaxy S5 mini. A keen eye will notice that the bezels above and below the screen are smaller, accommodating the bigger screen. The Alpha is also considerably thinner, if that's not obvious by first look. The Galaxy Alpha will inevitably draw comparisons with the iPhone - the flat metal sides are segmented by thin lines of plastic and look so familiar. Samsung's design features flared corners which improve handling a bit by preventing your fingers from slipping off the rounded corner. They also remind us a bit of the Samsung Galaxy S5 Active. The back of the phone is plastic, with the dotted pattern of perforated leather similar to the Galaxy S5 though here the pattern is finer and not resembling leather so much. While the plastic isn't the most premium material, the Samsung Galaxy Alpha impresses with a mere 6.7mm thickness. It's the slimmest Galaxy device to date though not the slimmest smartphone in general. The Galaxy Alpha also compares favorably against iPhone 5s, which measures 7.6mm thick and weighs 113g. The iPhone 6 is expected to be bigger and thinner than its predecessor but it remains to be seen if Apple can keep the weight down. And it's the upcoming iPhone that Samsung has in its sights, not the 5s. We can only suppose that the magic behing this reduced weight is the reduced battery capacity, which in this case amounts to only 1,860mAh. Indeed, the battery is removable, but it's still a measly capacity. The front is made of glass though Samsung has not revealed yet whether it's the usual Gorilla Glass or not. Under the glass is a plastic that matches the back in terms of color and the fine dotted pattern. 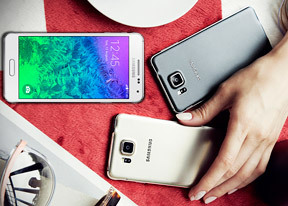 The Galaxy Alpha will be available in Charcoal Black, Sleek Silver, Dazzling White, Frosted Gold and Scuba Blue. The front of the device features an earpiece, the usual sensor array (proximity, ambient light and Air Gesture) and a notification LED. There's also a 2MP/1080p camera above the screen. Nothing has changed below the screen either, a hardware Home key is flanked by capacitive App switcher and Back keys. The Home key houses a hidden fingerprint reader, which can be used to lock the phone and authorize transactions (it's PayPay-certified). It also enables Private mode, which gives you access to a secure part of the storage where you can keep sensitive data and photos. The sensorama tour continues with a heart rate monitor on the back. It's placed next to the camera and is grouped with the LED flash in a small black segment amidst the colored plastic. Anyway, under the back cover you'll find a nanoSIM card slot but no microSD. The phone comes with 32GB of storage as default and that's all you're getting (there's no 64GB version announced yet). The bottom of the phone features a microUSB 2.0 port, a microphone and the grill of the loudspeaker. Positioning the loudspeaker here means it won't get muffled regardless of how you put the phone down (face up or face down) but is bound to draw even more comparisons with the iPhone. Note that's because the Galaxy Alpha is not water resistant like its Galaxy S5 siblings. The top of the phone houses the second microphone and an exposed 3.5mm audio jack. What's missing is an IR blaster, which both the big Galaxy S5 and S5 mini have. The metal sides of the phone host one hardware control each - the Power button on the right and the Volume rocker on the left. Both are made of metal and are slightly too thin for our liking, it makes pressing the keys slightly more difficult. Among the sensors packed inside the Samsung Galaxy Alpha is a Hall sensor, normally used to detect the opening and closing of covers. Samsung hasn't announced any dedicated Alpha covers yet but it would be interesting to see if they'll have a premium feel to them compared to regular S Covers. Note that there doesn't seem to be a barometer or humidity sensor on board.